Two teenage girls have been found guilty of murdering 39-year-old Angela Wrightson in a brutal attack in her own home. If she had been killed by adults, would this tragic story have been told? In many ways Angela Wrightson fitted the stereotype of a typical victim - an alcohol-dependent female attacked in her own home by people she knew. It's a profile which often triggers criticism of agencies - she was a vulnerable woman left to struggle alone, forgotten by authorities and dismissed as an aggressive drunk who had never worked. But this was not the case. She was in regular contact with agencies in Hartlepool, and offered frequent help and support. Ms Wrightson had a social worker who would visit her often and try to make sure money was spent on food and toiletries rather than alcohol. Her rent was paid by the council direct to the landlord, so a roof was kept over her head. In court a picture emerged of what professionals often describe as a "chaotic life", one of a woman known to the police for her anti-social behaviour and to the ambulance service for making hoax calls. She had been in and out of prison, had 47 criminal convictions, been subject to an alcohol purchasing order, had a number of Asbos, and frequently got into fights. Neighbours say she usually had bruises on her face. About 48 hours before she was killed she had sustained a serious head injury, a pathologist said, although it did not contribute to her death. There was evidence of brain damage from an even earlier head trauma. 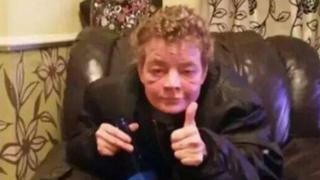 She was well-known in the Hartlepool area as "Alco Ange" - drinking at least nine litres of strong cider every day - and was often to be found lying in the middle of the road. Like her killers, Ms Wrightson had a difficult background. She and her eight siblings were all brought up separately in care, and she remained estranged from her family. Only after she died did her mother and aunt reappear into her world, occasionally attending the trial. A post-mortem examination found evidence of early self-harming and cirrhosis of the liver. She was covered in home-made tattoos, including a cross on her face. Carol Anne Davis, who in her book Children Who Kill profiled killers aged between 10 and 17, says many victims of child murderers resemble "a hated figure from their past". It's not a giant leap to suggest Ms Wrightson might have been a foreshadow of an equally hated figure from their own future. The girls were already heavy drinkers, in trouble with the police, hanging around the streets. In court, defence barrister Jamie Hill QC described the night as "just a terrible moment in history when these three people collided in the most appalling and tragic way". At the trial, details of a Dickensian cast of characters emerged - tens of people, including "Mad Molly", "Goofy" and "Cider Bill" would go to her home in Stephen Street at all hours of the day and night. They would not bother knocking. Groups of youths started dropping by first thing in the morning so she could buy them cigarettes. Underage drinkers congregated in her living room and on the proviso she could share their drink, she would buy them alcohol from the local shop - where three-litre bottles of 7.5% cider can be bought for about £3. Sometimes she called a neighbour "to make the kids scatter" when they ignored her pleas to leave. On the day she died, Ms Wrightson argued with her landlord, John Meggison, because he refused to buy her alcohol. She threw her keys at him a number of times. Eventually, he left with them and returned to the street the following morning to give them back. That's when he found her body. When Mr Meggison saw her there was no doubt in his mind Ms Wrightson was dead. The 39-year-old was surrounded by broken furniture, scattered blood-stained implements, and covered in shards of broken glass. She had hundreds of injuries, was naked from the waist down, and had bled out over the sofa on which she had been placed. It was a brutal end to a troubled life. Ms Wrightson had preferred prison to being "on the out". According to Donna Jenkins, who met her in jail, "Angie was a lost soul who found life easier inside. She'd become largely institutionalised". Her position as laundrywoman was "the first time she had felt valued", Ms Jenkins adds. Upon her last release from prison in 2011, Ms Wrightson, originally from Darlington, moved to Hartlepool for a fresh start. Ms Jenkins says "it was the happiest time of Angie's life". She had a boyfriend, and became friendly with some local dog owners. Then her boyfriend died from alcohol related problems, leaving her "heartbroken". From that point, her condition worsened and people began using her home, the trial heard, as a "doss house". They stole money and mobile phones from her. She stopped buying food and instead spent her benefits on alcohol - she weighed about six stone when she died and by common consensus looked a lot older than her 39 years. Ms Wrightson would begin drinking as soon as she woke up and would carry on until she crashed out, rarely using any part of the house other than her living room, sleeping on the sofa. But the darkness and confusion of Ms Wrightson's life was punctured by small pinpricks of kindness. She would buy chocolate bars when she was buying cider, and poke them through the letterbox for the young son of a neighbour. She loved animals, and looked after an acquaintance's Alsatian for three weeks, which gave her a purpose and stemmed her drinking. She was devastated when she had to give it back. She was described as house-proud, filling her home with china knick-knacks and teddy bears from the local second-hand shop. Pictures hung on her walls and her kitchen was neat and tidy, if a little bare, because she sold many of her items for drink money. It was easy to take advantage of Ms Wrightson. Her usual behaviour inspired neither friendship nor loyalty. When drunk she was out of control and unlikeable. Once, wielding a metal bar, she chased a girl down the street. She would call her landlord with fictional problems - saying windows had been broken when they had not, and then threatening to break them herself if he did not do what she wanted. Her life was knotted with seemingly trivial arguments: Who stole whose tobacco; who was badmouthing whom; whose turn was it to buy drink. Her neighbour Siobhan Quinn says Ms Wrightson would sometimes cry and claim she had no family at all. She would telephone Ms Quinn to say she had no electricity, or her microwave was broken. "Angie craved company, that's why she caused havoc sometimes. That's why she would call me and get me to the house. She was just lonely," she adds. In an attempt to assuage the loneliness, Ms Wrightson would allow a steady stream of people into her home, but of the many who wandered through her door, no-one really seemed to be concerned. Image caption More than a quarter of occupied households on Stephen Street are categorised as "economically inactive"
At about 23:00 on the night of 8 December, her sometime drinking companions Tracey Gascoigne and Melanie Moon banged and shouted at her window, wanting to be let in to drink. At that point, Ms Wrightson was inside - and so were the two killers, hiding in the bathroom. She was unable to call for help. She was either unconscious or already dead. Ms Moon impatiently tried Ms Wrightson's front door, which was unlocked. She put her head round and saw the devastation within the living room. She shouted to Ms Gascoigne: "Someone's wrecked Angie's house - you should see the state of it." The reply came back: "I don't care." There were chances to save Angela Wrightson - many of which were sabotaged by herself. In 2009 she was banned from buying alcohol. The Safer Hartlepool Anti-Social Behaviour Unit says she "consistently refused to engage" with the support she was offered over a number of years. She also "refused to stop her drunk and disorderly behaviour". And she ignored the ban. In 2012, Ms Wrightson spent about eight months at a residential facility where she was helped to get sober. She was doing well - until she worked out a way to leave and buy drink. On several occasions she returned to the unit drunk and aggressive, and the police were called. In 2013, her care team managed to secure funding for her to go into a rehabilitation retreat near York. Her social worker drove her there and settled her in. Within 24 hours Ms Wrightson took a taxi back home because she "was desperate for a drink". There were many attempts to get her back into the retreat, but she kept leaving. Before long the opportunity was gone. Angela Wrightson's story is not unusual. The local area profiles for England indicate the levels of alcohol-related harm in Hartlepool are among the highest in the UK. The town is ranked 320th out of 326 local authority areas for the percentage of at-risk drinkers in the population. Stephen Street is a run-down road where a significant number of houses are boarded up, and more than a quarter of occupied households are categorised as "economically inactive" - meaning residents are neither in work nor seeking employment. Men and women clutching cans of strong lager and cider gather in grimy doorways and the nearby car park and graveyard. The crime rate in Hartlepool is high, especially anti-social behaviour, violent crime and criminal damage. On Stephen Street, one woman was jailed for biting a police officer, another for dealing cocaine, another for arson. The Institute of Alcohol Studies has previously outlined study findings that alcohol is involved in nearly half of all violent crimes. Situations in which people get drunk are more likely to flare into violence, and Angela Wrightson was on both the giving and receiving end of arguments that culminated in physical altercation. In 2014, the year Ms Wrightson was killed, there were 515 cases of murder or manslaughter in England and Wales. Few capture the full attention of the media. If she had not been the victim of teenage girls, the difficult truth is her tragic story may not have been told.